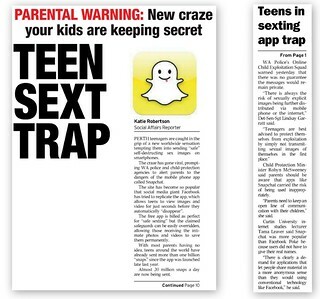 My Sunday began with a twinge of disappointment as I found out that an interview I’d given to a local reporter had been used to give credence to an awfully sensationalist moral panic piece about young people, sexting, and anonymous messaging apps (mainly Snapchat and Facebook’s new Poke). While The Sunday Times isn’t exactly a bastion of investigative journalism, I was nevertheless disappointed since I’d tried to provide a bit of context for these apps, emphasising that in the vast majority of cases the material being sent was harmless, but that when more intimate material was shared, the most important dynamic was trust between the people communicating, not the nitty gritty technical details of the app itself (if someone really wants to find a way around deleting online material, they will). I know academics should always be wary of journalists reporting on sensationalist topics, and to be fair I’m not actually misquoted, just used to add support to an otherwise pretty vacuous piece, but it nevertheless smarts to be associated with a story using the headline ‘Teen Sext Trap’ in giant letters. My first instinct was to be very annoyed with the journalist, Katie Robertson, who I’ve provided comments for in the past. However, after searching the web, I was swiftly reminded that journalists are but one (small) cog in the machinery of sensationalism. This became evident when I found several versions of the same story, in different locations all owned by Murdoch’s NewsCorp (as is the Sunday Times). (You can see article on the Sunday Times front page in all its glory.) 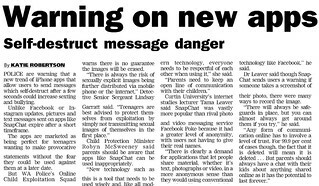 An online version under the headline ‘Teenagers embrace new secret sexting craze on smartphones’, with the same text from the Sunday Times version, also appeared on the Perth Now website, and The Australian website. The Tasmanian Sunday version, written by the same reporter, released on the same day, is far more balanced and does justice to what I’d mentioned in her interview. I suspect – and haven’t yet asked – that this second version is closest to the article originally written, and that the Sunday Times (and online) version has seen a lot more input from editors seeking to increase sales. This is always the case – that the editors overrule the journalists – but often this input is, initially, invisible. Now I’ve been reminded, I’ll do a better job of remembering that even when you feel a decent rapport with a journalist, they often won’t have control of the words that are released under their name. That said, I do think it’s very important that academics engage with the press since it’s often in that arena where the public come across important information. For me, it just means being a little more wary (and possibly sticking to radio whenever possible). There will always be safeguards in place, but you can almost always get around them if you try. Any form of communication online has to involve a level of trust. In 99.9 per cent of cases, though, the fact that it is deleted will mean it is deleted. … But parents should always have a chat with their kids about anything shared online as it has the potential to last forever. You should write more for The Conversation where this kind of stuff wouldn’t happen. The one time I commented in detail to a journalist about a client (with the client’s permission) I was significantly misquoted and the article made the client and I both sound like lunatics. There’s that lesson learnt!